Twins - The One with the Blinds! 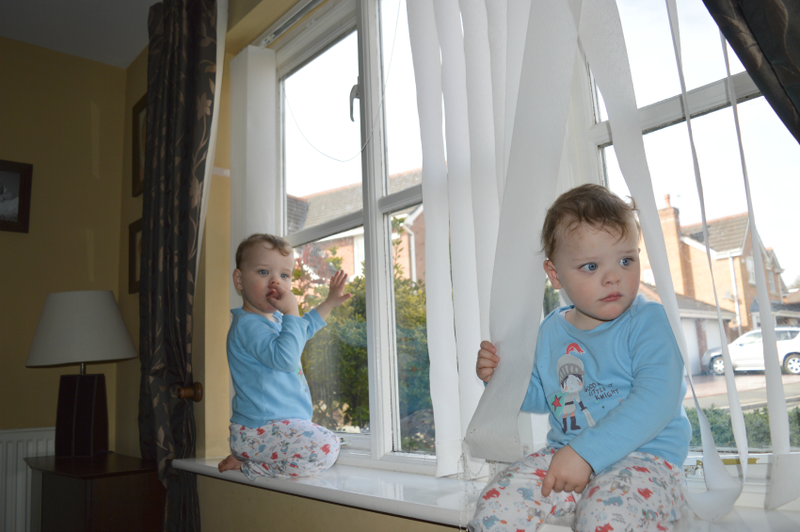 What you are seeing here is my 2 delightful babies sitting in the window 'playing' with my vertical blinds. They have been pulled back and the pull cords secured for safety, but they still manage to get at them. Every weight has been removed and the chains are snapped and tangled. Lovely! I know. We're falling over the toys to get to them when they are in full 'wrecking' mode. They are driving me mad. I know it will pass, but hope it's sooner rather than later. Thanks for reading. Oh, the blinds... I don't know how kids so small can be so efficient at breaking those plastic chains. You have my sympathy! Thank you. They are a nightmare and so intrigued with anything that isn't a toy. Wires are the worst! Thanks for reading.